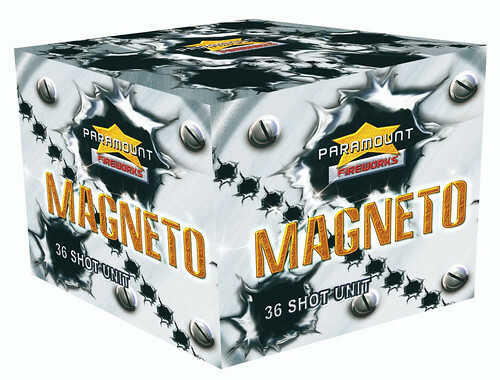 The Magneto is an exciting new 36 shot single ignition firework from Paramount. There is superb value for money from this raucous firework which delivers huge long lasting palms with massive silver arms that hang beautifully in the sky and overlap giving a multi-layered effect. With these dazzling palms that seem to fade in slow motion, this firework is set to become one of our best sellers of this year and is ideal for any occasion. Magneto is so loud you just have to buy it! Better still, buy two and really fill the sky with massive multi-layered palm bursts.Stunning! A REALY classy firework, with a nice effect and good duration, i used three of these in my finale with 6 other similar cakes fire out at vee\'s, it was a stunning finale and at the price a real bargin.